as to what I am doing! Family is worried about me etc! So If I am not my 'usual' self don't be alarmed - at least you will now know what the reason is! I am so sorry to hear about your Mom. I lost mine many years ago and I still miss her. She was so sick for so long it was a relief that she was no longer suffering but it did not stop the painful time we all had to go through. The poem below is very heart-touching. I think it brought tears to everyones eyes. This painful time will turn into are the wonderful memories you have of her and with her. Hang in there and I will praying for you. Linda in Ga.
Tears and hugs for you...I know where you are at. Just know that you are among friends. I am going to post my reply seperately as well just in case no body returns to this original posting as I would like them to read my THANK YOU! So please bear with me as I 'repeat' myself! I don't know how to even begin to thank you for all the love, concern, prayers and words of comfort you have all given to me! It means the world to me - you actually will never know just how much at this time! My mom's memorial service will be next Sunday at 13h00 in Johannesburg as her wish was to be cremated. A few of us wanted it to be earlier but this was not convenient for my other sister's & my mother's friends so we agreed on this day. I miss my mom so very much by I realize that she is now at peace and no longer in any pain etc.... I just miss her and I suppose as so many had so much I still wanted to say! What is so very special is that my mom had hand written letters to each of us - we all received 3 each - 2 addressed to husband & wife (one dated 1997 & other March 2008) and then the other to each of her children personally which must have been written just recently in 2009 - undated. These letters are so very special to me as I know they are to my brother and sisters too! something to treasure! The poem is so beautiful and really made me cry - I have never read something so though provoking before! Thank you Cracker, I appreciate you sharing this with me!! Once again my sincere thanks & gratitude for caring and being here for me!! I am so sorry to hear about your Mom. I'm really behind in reading the postings. Just remember that our memories are always there. You will be surprised at when they just pop into your head! So sorry to hear this....my heart goes out to you. I will keep you in my prayers. Take care and let us know if we can do anything for you. So sorry to hear of your mothers death. 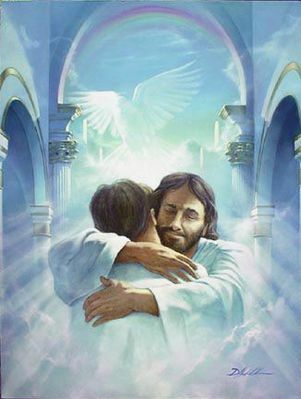 Hugs to a cute friend and I shall keep you in my prayers. Take Care. So sad to hear this news,may she rest in peace, and may you also find peace. Oh sandie, so sorry to hear this.hugs and prayers for you and your family.she will never realy leave you, but stays with you in your mind and in your heart,take good care. I'm very sorry to hear about your loss Sandie, may your mom rest in peace and you find comfort in knowing that God keeps us all in His care. Hugs and prayers for you. I am so sorry for your loss. Losing your parents is so hard, my thoughts are with you. I am so sorry.....it isn't easy to lose our mothers, no matter the age or circumstance. My prayers are with you. Close your eyes and feel this hug. I am so sorry about your Mum. I do understand your grief as I am dealing with grief myself at this time. All I can say is God Bless and take 'One Day at a time'.You look after yourself. I'm so sorry Sandy...yes I know what you are going thru..I still can't sleep (have had 4 hrs. in the last 3 days)...you will walk in circles for a while. You have my prayers and sincere sympathy. Sandy, sorry to hear about the loss of your mom, my deepest sympathy is with you. I too am so sorry for your loss. I lost mine not to long ago. I tis very harf and sad but let your faith and the Lord hold you. Just take it minute by minute and stay strong. My prayers and heart felt sorrow are with you. Gob Bless you and your family. I'm so terribly sorry to hear your sad news. I don't think there is anything more difficult to face than losing your Mum. My heart truly aches for you. I pray that the Good Lord will give you the strength to come to terms with your loss. The pain does heal in time, but it takes a long time. You will be in my thoughts and prayers, Sandie. Sandie my deepest sympathy & prayers in this sad time. I have just come on line and saw your posting. I am so sorry to read that your Mum died yesterday. I cannot imagine the heartache you are going through. But Oh! what a special blessing to have only spoken to her 2 hours previously. God is good and He will not overload you and give you more than you can bear. It is good to cry and let the emotions flow. And hey, isn't it great to remember all the good times? Just wanted to let you know that my prayers and thoughts will be with you over the coming days and weeks etc. I don't know about you but I would feel like saying - "Hey world, do you know that my Mum has died" and shout it out to everyone who can hear you. And then you wake up the next morning and life goes on. I suppose it is the way it is meant to be, but I just feel it is so unfair. I'm so sorry! My heartfelt sympathy goes out to you and yours! The prayers of many are with you in the upcoming days. The memories will grow sweeter as time goes on, but a mother is always missed for years and years. Hang on to the Lord! So well said. This is beautiful. Thanx for sharing this poem..I sit here crying...but it is OK I know He is heaven looking after me. Nice poem, thanks for sharing it. And I'm crying too. That is really nice, looks like we are all crying. This poem is the most heartwarming one I have read. Yes I too have tears. This is beautiful..I am going to copy it. My mother has lived with us for the past 15 yrs. She is legally blind and has just recently contracted a bad respiratory bug. We worry every day...she will be 89 yrs next month. Thank you for printing this, you have no idea how much it means!! Sandie, dear one - I can tell how hard this is one you or you would be much stronger - for the family and they wouldn't be so worried about you - you just do what you need to do - for the time being - get through the services and everything - I will be praying for you and the rest of the family - you will need some extra strength to deal with this - I do believe, because you had spoken to her just less than 2 hours before her passing - that she knew that you would be able to handle her passing - they always wait for the one that they are worried about and when they speak to them - they know that it is ok for them to pass - I know you will treasure that last conversation with her, too. Take care of yourself and do whatever you can - to get through this time. My heartfelt sympathy goes out to you and yours and will keep you in my prayers. So sorry to hear of your great loss. You are in my thoughts and prayers. I'm so sorry! YOu and your family are in my prayers. I thought of you when I saw this video. It's a beautiful video. It is hard when a family member passes. Try and remember the good times and take care of yourself. Oh I'm so sorry! I lost my mom about a year ago and I can imagine how you feel...my thoughts and prayers are with you...my mom had been ill and was in the hospital. I was told by the doctor that she was being discharged in the morning because she was doing so well. I got a call instead that she turned for the worst and needed to come right away. I knew at that time she was gone....my memories are so important. I think of all the laughts and funny things she did...One thing I will share with you is...she went shopping, mind you she was 80 at the time and she bought herself a thong. When I asked her why she said they were on sale. The funny thing was she didn't know how to wear one. She complained how uncomfortable they were....she had me in stitches and I'm laughing as is write this...but I'm also missing her trememdously...So God Bless you and your family and hang on to all the great memories you will have forever! I am so sorry for the loss of your mother. God bless you and be with you at this time. It is hard to know that she will no longer here for you, but she will always be with you in your heart. (()) to you. So very sorry to hear this. It is hard, I know. But you will get through it - all the Cuties are here to listen and offer shoulders to lean on should you want one.